A few months ago I did a post on common errors that arise when people try to self-estimate their IQ. One concern I sort of covered at the time was that many people may not truly understand what IQ was. For example, there seems to be a tendency to confuse educational attainment with IQ, which is likely why many of us think our grandparents were not nearly as smart as we are. Introductory Psychology Textbooks“. As the study suggests, the authors took a look at intro psych textbooks to see what they say about IQ, and how well it aligns with the actual published research on IQ. So what did they find? Let’s take a look! Most of what undergrads learn about intelligence will be learned in intro psych. To back up the premise of the study, the authors looked at the topics covered in psych programs around the country. They determined that classes on intelligence were actually pretty rare, and that the primary coverage the topic got was in intro psych. Once they’d established this, they were able to pull the 30 most popular intro psych textbooks, and they chose to analyze those. Given the lack of subsequent classwork and the popularity of the textbooks used, they estimate that their study covers a huge proportion of the formal instruction/guidance/learning on intelligence that goes on in the US. The percent of space dedicated to discussing intelligence has dropped The first research question the authors wanted to look at was how much space was dedicated to explaining IQ/intelligence research to students. In the 80s, this was 6% of textbook space, but now it’s about 3-4%. Now it’s possible that this is because textbooks got longer (and thus the percent dropped), or it could be that the topic got de-emphasized. Regardless, an interesting note. 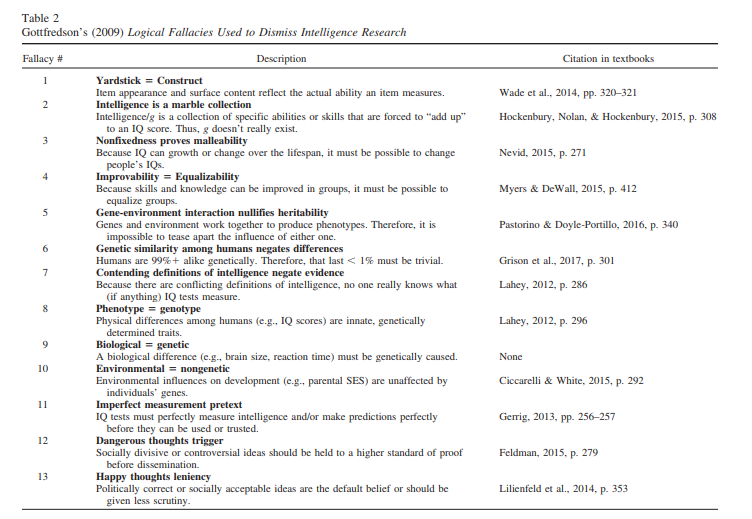 IQ Fallacies were pretty common The list of possible IQ “fallacies” was drawn from two sources. The first was from this article by Gottfredson et al, which was published after “The Bell Curve” came out and had 52 signatories who wanted to clear up what current research on IQ said. The second paper was a statement from the American Psychological Association, also in response to the publicity around the Bell Curve. They used these two papers to generate the following list: The most common fallacies they found were #2, 3 4 and 6. These were present in 8 books (2 and 3) and 6 books (4 and 6) respectively. Interestingly, for #3 they specifically clarified that they only called it a fallacy if someone asserted that you could raise IQ by adding a positive action as opposed to eliminating a negative action. Their example was that lead poisoning really does provably lower IQ, but fish oil supplements during pregnancy have not been proven to raise IQ. The initial two papers explain why these are viewed as fallacies. Briefs discussions led to inaccuracies In addition to fallacies, the authors also took a look at inaccuracies, questionable theories, and the proportionate amount of time authors spent looking at various topics. Many of the textbooks committed the errors of citing part of the story, but not the full story. For example, it was noted that testing bias was well covered, but not the efforts that have been made to correct for testing bias. Some textbooks went so far as to say that all IQ tests required you to speak English, where as nonverbal tests have been available as far back as 1936. Additionally, some theories of intelligence that have not born out well (Gardner’s theory of multiple intelligences and Sternberg’s triarchic theory of intelligence) were two of the most discussed topics in textbooks, but did not include a discussion of the literature supporting those vs the g theory of intelligence. I imagine the oversimplification issue is one that affects many topics in intro textbooks, but this does seem a bit of an oversight. Overall context of intelligence scores was minimized Despite good proof that intelligence scores are positively correlated with various good outcomes, the most surprising finding was that several textbooks said directly that IQ only impacted education and had little relevance to every day life (4 textbooks). This directly contradicts most current research, and also a certain amount of common sense. Even if IQ only helped you in academia, having a degree helps you in many other areas of life, such as income and all the advantages that brings. Overall this was a pretty interesting paper, especially when they gave examples of the type of statements they were talking about. Reading the statement from the APA and comparing it to the textbooks was rather interesting, as it shows how far it is possible it is to drift from consensus if you’re not careful. Additionally, the authors cited some interesting work to show that some popular public misconceptions around IQ are directly mirrored in the intro psych textbooks errors. Overall I think the point is well taken that intro to anything textbooks should be given a lot of scrutiny in making sure their claims are factual before being assigned. Those fallacies may not be formally taught elsewhere in college, but they are reinforced in the general college-educated culture, beginning when they were merely “college-bound” and taking the SAT and extending throughout life in the press and in everyday discussions. Psych intro does sound like the anchor, though, doesn’t it? My theory is that the amount of space in text has gone down because the research doesn’t support what is taught. People want things to be true, so they are presented as true. I think it comes from a culture that values intelligence more than some moral categories we should be encouraging instead. Therefore, everyone wants to think they have it, wants an IQ test to tell them they have it, and so project their own views on what IQ “must” measure. Or if it doesn’t give them their preferred answer, how IQ “must” be wrong. Yeah, they had me pretty convinced by the end that what goes in that textbook is more important than I thought. As for the “more important morals”, I wonder if that’s what some of the “this doesn’t correlate with much” was about. Probably can’t rhapsodize about other virtues in the section on psychometrics.